Logi Analytics, the leader in self-service analytics, today released findings from its fourth annual State of Embedded Analytics Report, which found that the adoption rate of embedded analytics among business users is twice that of traditional BI tools. The report, which studied how organizations embed business intelligence and analytics inside their software applications, revealed that embedded analytics continues to improve user satisfaction and increase end-user adoption of analytic tools. When users are forced to leave their preferred business applications to conduct analysis, they are less likely to use that analytics tool. The report found that 43 percent of application users leverage embedded analytics regularly, which is double the user adoption rate of traditional BI tools reported in the 2015 State of Self-Service Report. Application providers say they expect the adoption rate of embedded analytics to increase to 52 percent within two years. End users expect BI inside the applications they use every day – 87 percent of all application providers say that embedded analytics is important to their users, up from 82 percent in 2015. For the first time, embedded analytics has become a top priority for executive management – 36 percent of application providers note that the CEO or the executive management team is the primary driver of their decision to embed. This is the first year the executive management tied with product management as the top individuals driving embedded analytics projects within organizations. Embedded analytics improves customer satisfaction – 93 percent of all application providers say that embedding analytics helps to improve customer satisfaction and user experience. The majority of application providers (65 percent) plan to invest in embedded analytics in the next 12 months – This includes providers who already embed analytics, and are looking to upgrade the analytical capabilities they have embedded. Embedding analytics drives revenue – 93 percent of commercial ISVs and SaaS providers say embedded analytics has helped them increase revenue. Software providers said they charge 24 percent on top of their core offerings. 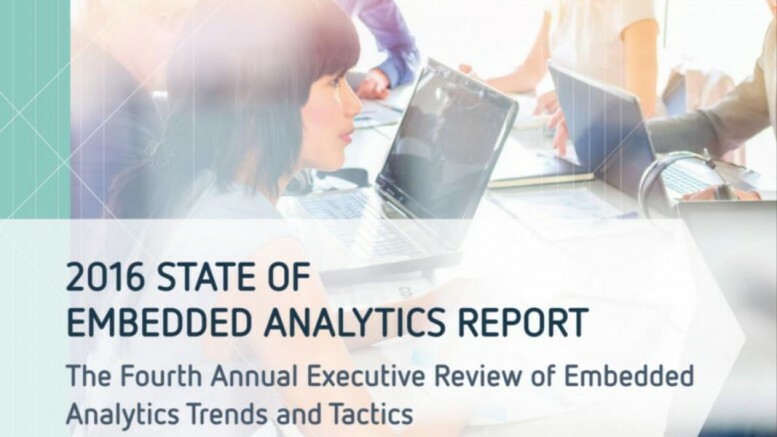 The 2016 State of Embedded Analytics Report is based on an online survey of more than 500 business and technology professionals, conducted in February of this year. Respondents included C-level executives, Product Managers, Product Developers and Software Engineers at companies of all different sizes.